In order to assure proper fit the wearer should measure around the torso at the level of the stoma while lying on your back on a flat surface. In order to determine the size opening needed for a two piece pouch it is necessary to measure the diameter of the flange on the wafer. This is the ring that the pouch snaps on to. 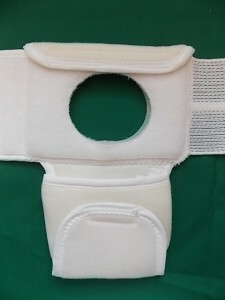 The belt openings for all of the stoma support systems are 2 3/8″ round or 2 3/4″ round and for larger pouch systems or for larger and wider ostomy pouches there is now available the new oval opening of 3½” wide and 2 ¾” high.